VeryMag Responsive Magazine Blogger Template is another beautiful Template from our collection that is the perfect choice for the magazine's website. If you want to create a new Unique Site or want to create a blog related to news, magazines and fashion niches, ..
so definitely this is the Perfect choice for you. Not only will this give you a beautiful Great look at your site, but it will also help you optimize it for easy positioning. search Engine results. So you can get more Unique visitors traffic. 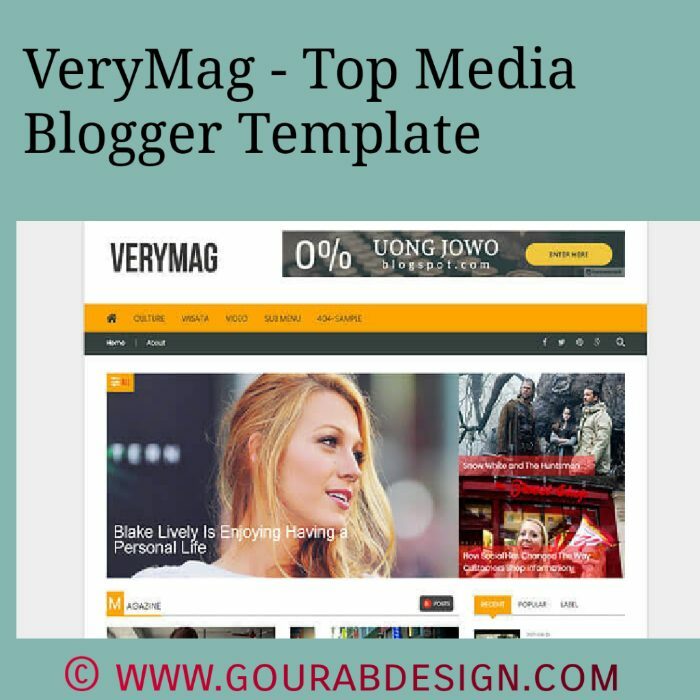 One of the top benefits of using the Verymag blogger model is that it is professionally designed by popular designers Made by Gourab Design, which means that it will not only increase your site's position, ..
but will also help you load your blog very quickly And Fast . Many popular magazines, fashion sites and makeup tips use this type of template to make their website look better than their competitors. We recommend using this on the blogs you want to rank on Google Search Engine also all Bing , duckduck go etc. Because an SEO page of this template is also produced and also offers a completely Responsive design. which means that loyal readers can easily access your website from different parts of the world. So, using a template that comes not only with a professional but has a Premium design, it's not a bad idea to use it on your website. VeryMag is a Seo Friendly Theme that is best suited for news and media and journalists who want to create a news page. It is suitable for all types of blogs, whether traveling, running, technology, fashion, etc. This is a quick and Very Faster load on your website. It's easy to use and Install on your website. It is easily optimized.also customizable.